Apple and Google has a tight competition in almost everything when it comes to technology. This season, the two giant brand releases their latest flagship phones — the Apple iPhone X and Google Pixel 2 XL. 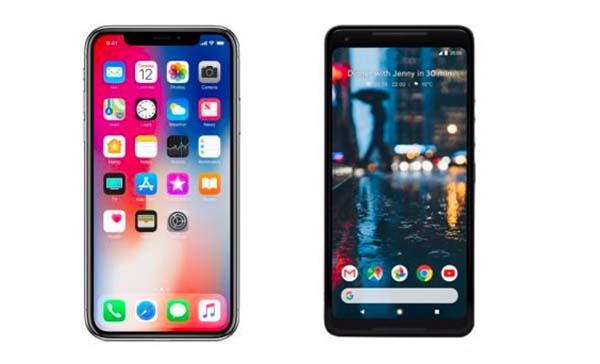 How the iPhone X and Pixel 2 XL fare in terms of specifications? See below. iPhone X and Pixel 2 XL both sports an edge-to-edge OLED screen. Pixel is a bit bigger with 6in display compare to 5.8in of iPhone X. Pixel is also thicker and heavier than iPhone X. The base storage begins at 64GB for both units but customers can choose model with bigger 256GB capacity for iPhone X compare to Pixel 2 XL with 128GB only. The iPhone X is equipped with A11 Bionic chip that runs with 3GB memory of RAM while Pixel 2 XL has Qualcomm Snapdragon 835 with bigger RAM of 4GB. Both rear cameras can record 4K video resolution but the iPhone X has only 12 MP while the Pixel 2 XL has 12.2 MP. The iPhone X has a smaller battery with the capacity of 2716 mAh compare to Google Pixel 2 XL with 3520 mAh. Both phones should give 12-14 hours up-time in a normal mixed usage. However, the iPhone X is capable of wireless charging while Pixel 2 XL is equipped with fast-charging feature. For the security feature, iPhone X uses the advance Face ID system, a big selling point, while Pixel 2 XL remains with the traditional Fingerprint sensor. iPhone X starts at $999 in US, the 256GB version costs $1,149. Preorder opens on October 27th. Google Pixel 2 XL starts at US$849 and currently out in the market. While it’s hard to tell which is better, the comparison above might help consumers to decide which mobile phone to get.